1. Make the Cookies: Adjust the oven racks to lower-middle and upper-middle positions and preheat the oven to 375 degrees F. Line two baking sheets with parchment paper or a silicone baking mat. 2. In a large bowl, whisk together the flour, baking powder and salt; set aside. 3. Beat the butter at medium speed for 30 seconds to loosen it up. Keeping the mixer running, gradually add in the sugar and then gradually increase the speed to medium-high and beat until the mixture is light and fluffy, about 3 minutes. Scrape down the sides of the bowl and add the eggs, vanilla and lemon extract. Beat at medium speed until combined, about 30 seconds. Scrape down the sides and bottom of the bowl again. With mixer on low speed, alternately add the flour in four additions and the milk in three additions (beginning and ending with flour), and mix until just combined. Give the mixture a few final stirs with a rubber spatula to ensure all of the flour has been incorporated. 4. Use a ¼-cup measuring cup to scoop mounds of dough onto the prepared baking sheets about two inches apart. Using moistened fingers, gently press each mound of dough into a 2½-inch circle. Bake until the edges of the cookies are set and light golden brown, about 20 minutes. Allow the cookies to cool for 2 minutes on the baking sheets, then remove to a wire rack to cool completely. 5. Making the Icings: Melt the chocolate either in a medium bowl set over a small saucepan over barely-simmering water, or using the microwave on 50% power in 30-second increments; set aside. 6. In a medium saucepan over medium heat, bring the water and corn syrup to a boil. Remove from the heat and whisk in the powdered sugar and vanilla extract. Transfer ¾ cup of the icing to the bowl with the melted chocolate and whisk to combine. 7. Ice the Cookies: Place wire racks over wax paper to catch any drips. 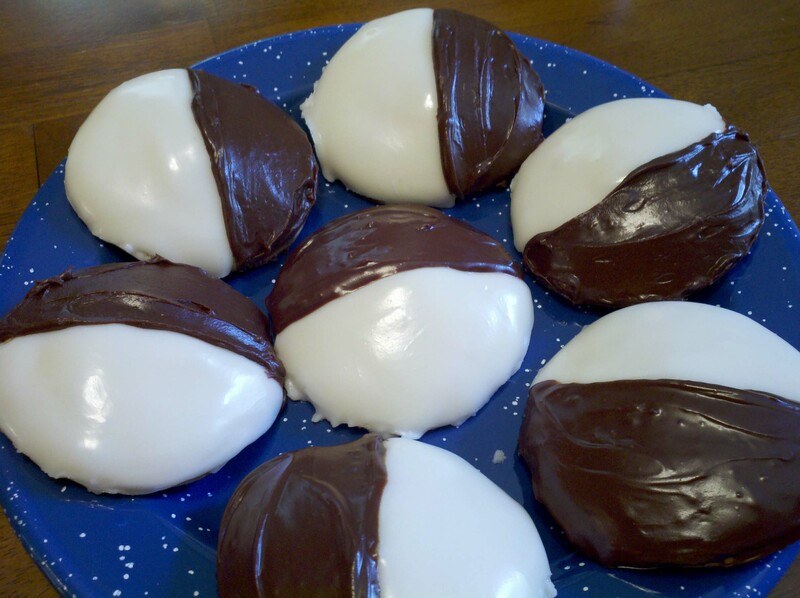 Use a small offset spatula to spread about 2 tablespoons of the vanilla icing onto half of each cookie. The icing should move on its own when the cookie is tilted; use the spatula to scrape any excess from around the edges. If the vanilla begins to thicken too much, stir in a teaspoon of warm water at a time until the icing goes back to a smoother, looser consistency. Place the finished cookies on the wire racks and allow to set for at least 15 minutes. 8. Again using a small offset spatula, spread the chocolate icing on the half of each cookie, scraping any excess icing from around the edge of the cookies. If the chocolate icing thickens too much, place the bowl on a small saucepan of barely simmering water so that it can re-melt. If it’s still too thick, you can add warm water, a teaspoon at a time, until it returns to the correct consistency. Place the finished cookies on the wire racks and allow to set for at least 1 hour. 9. The cookies can be stored in an airtight container at room temperature for up to 3 days. If you stack the cookies, be sure to place a piece of wax paper between layers.